The Shawano Food Court is made up of six food stations where students can purchase entrees which are considered a complete “lunch”. 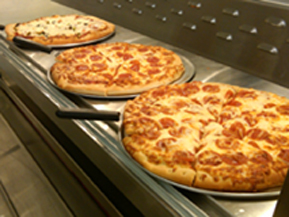 The food court caters to a majority of students’ tastes by offering a variety of popular food choices each day. Some of our students prefer to choose similar foods each day, while others opt to select from the various stations depending on the daily offerings. Throughout the school year, we constantly evaluate menus and implement changes based on student input. We welcome suggestions and requests for new menu ideas and will try to honor them.